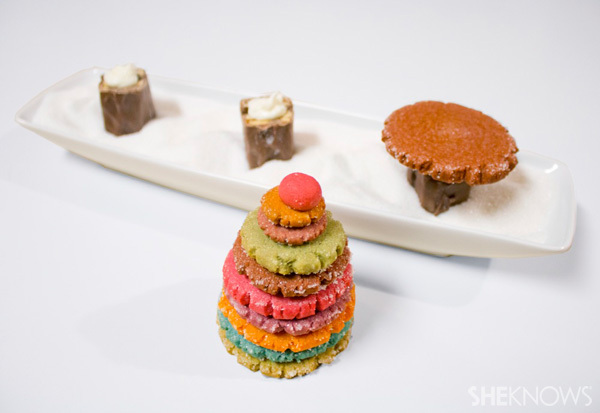 Bring joy to any holiday gathering with this simple, colorful and edible cookie display. These would be the perfect sugar cookies for your holiday potluck, party or even for a cookie exchange party — everyone will be excited to take one home! 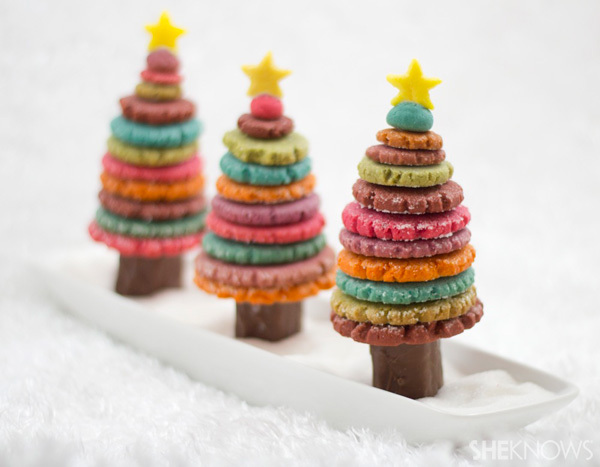 Planted atop candy bar tree trunks and nestled in snowdrifts of sugar, Christmas cookies never looked so sweetly spectacular. This recipe will yield approximately 94 cookies of graduating size, which will create 12 complete Christmas trees with about 8 cookies in each tree. We used a brand of all-natural vegetable colorants. The colors are much more muted than regular gel food colors, and the dough will require a lot more of the natural colorants to get the colors this dark. These three bottles of red, blue and yellow cost $15, and this recipe will require every drop. 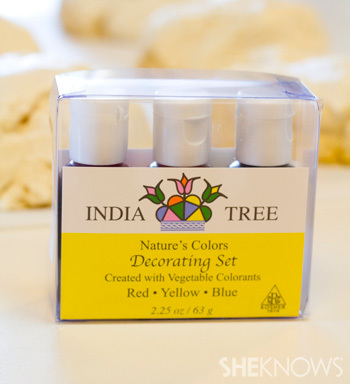 You can get brighter colors with less colorant using regular gel food color. Cream sugars with butter. Beat in eggs. Add oil. Combine dry ingredients together, and then gradually add them to the sugar-butter mixture. Mix in vanilla and extract flavor. Split dough into 6, even-sized balls. 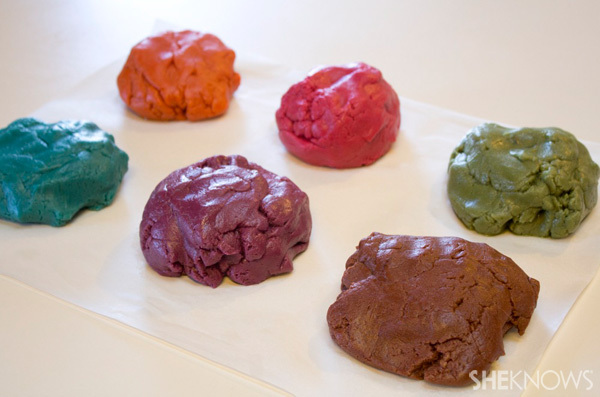 Add food coloring to each of the dough balls until desired color is achieved. 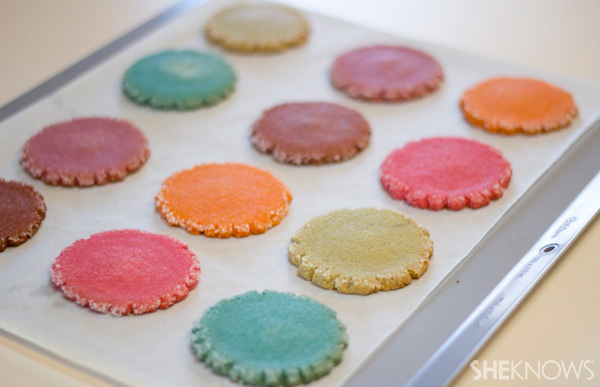 Tip: You don’t have to have an exact number of cookies per color or exact sizes of cookies or trees. You can mix and match as you assemble them. Some trees can be shorter and some can be taller — just like a real forest. And the color patterns don’t have to match either. In fact, it’s more interesting if they’re random. From each color of dough, break off two small pieces to form 2, 2-inch dough balls. Place them on a baking sheet lined with parchment paper. 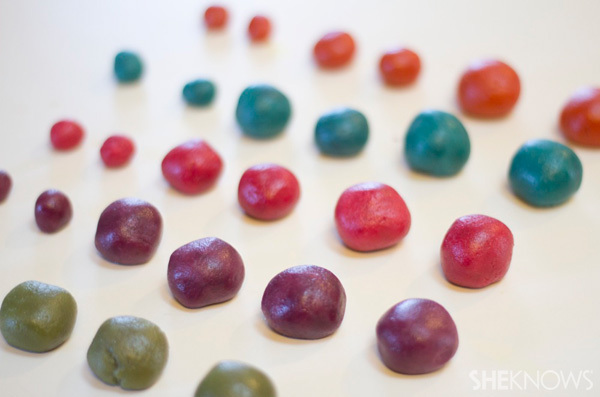 Then, roll another set of smaller colored dough balls, and keep doing this until you have about 16 dough balls of each color, in several varying sizes. Dough ball sizes should range from 2 inches to 1/2-inch. 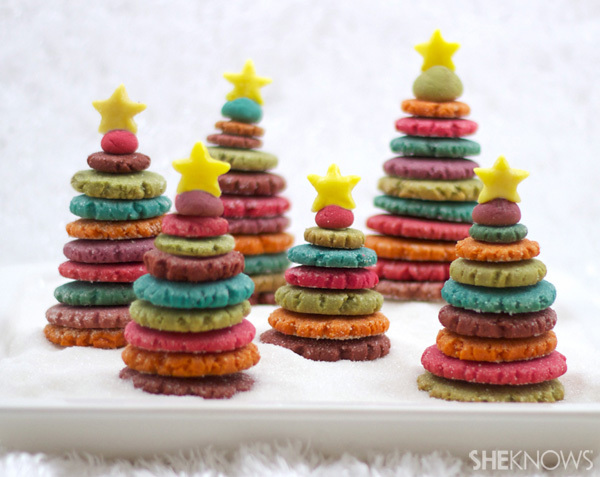 Any leftover dough can be used to make extra cookies of any size, allowing for a few taller trees. 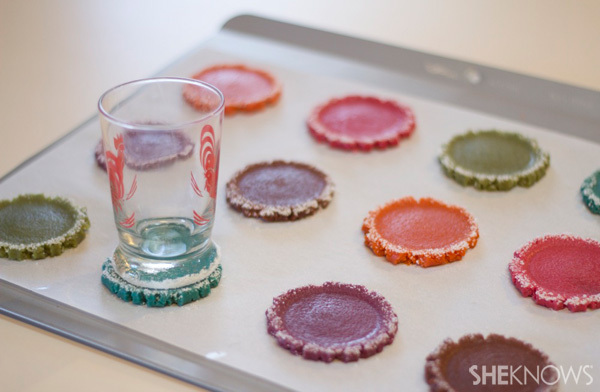 Tip: Use a shot glass for the smaller cookies. Dip the bottom of a glass into granulated sugar, and press the dough balls flat with the bottom of the glass. Start baking your largest cookies at 350 degrees F for 12 minutes. When they are done, put your next size batch in for 10 minutes, and then your smallest batch in for 8 minutes. Let them cool while you make your tree trunks. Cut a full-sized Snickers candy bar in half and wiggle into a pile of granulated sugar on a platter or in a jar. Add a dollop of frosting on top of the candy bar to secure the bottom cookie. 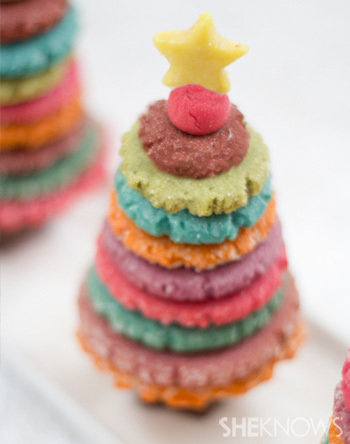 For more stable trees, add another small dollop of frosting in between each cookie layer as you stack them. Stack the cookies with the largest cookies on the bottom, graduating to the smallest size on the top. If you want to forgo the trunks, just stack the cookies on top of the granulated sugar without the candy bars. To make the star on top, use lemon Starburst candies and a star-shaped cookie cutter. Again, another small dollop of frosting on the bottom of each star will secure it in place. 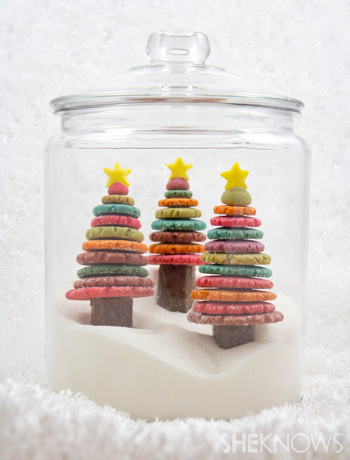 To make these into an adorable and festive edible Christmas centerpiece, place them into a glass jar filled with granulated sugar.